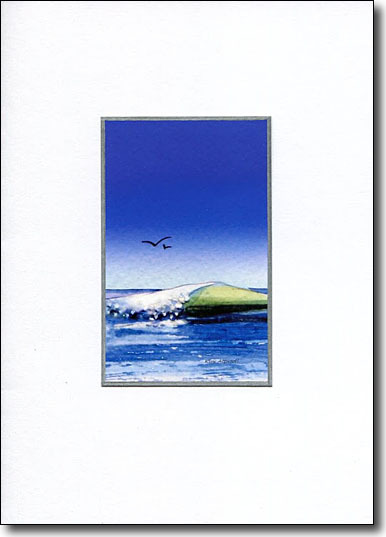 Handmade beach cards that reflect the inviting vistas of beaches and sun kissed seascapes are inspiring cards to send for all occasions. 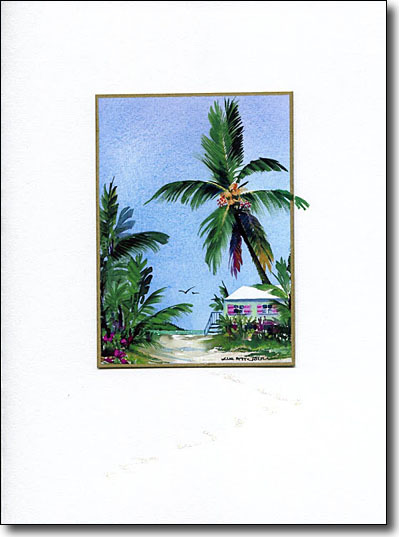 This greeting card uses a painting that I did while vacationing on Conch Key. 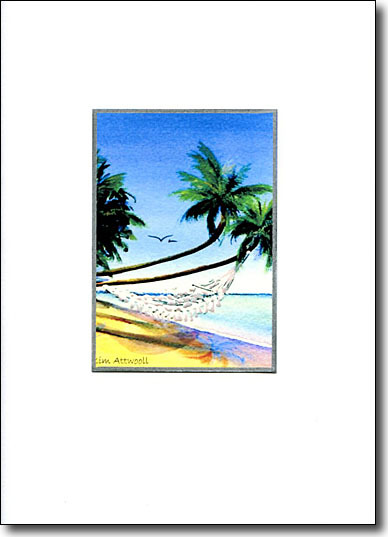 It epitomizes relaxation. 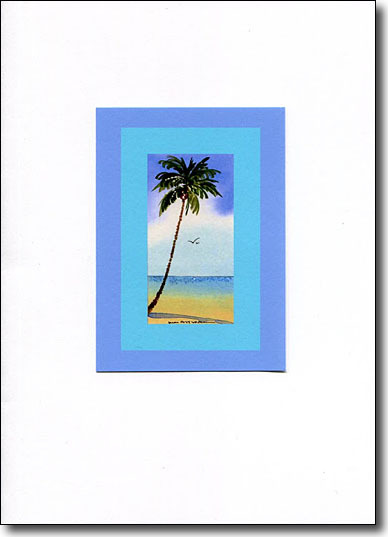 Send a card with a clever design. 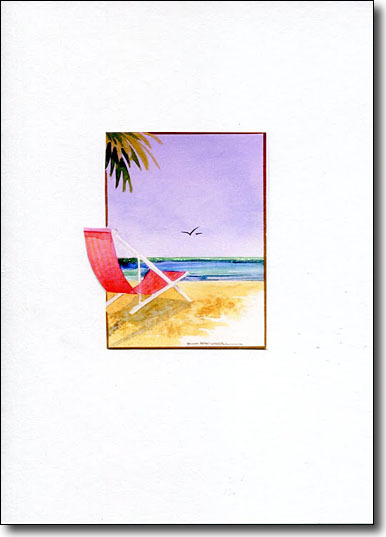 The beach chair is cut out in every card and invites the recipient to sit a while. 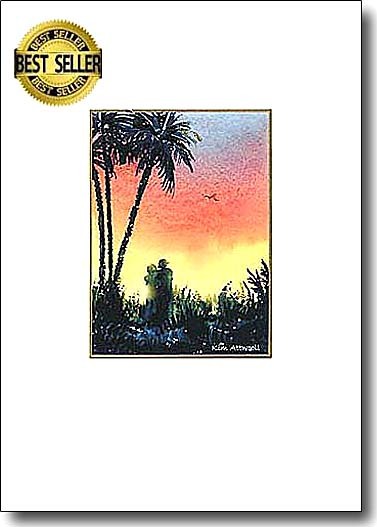 The grand beauty of the Hawaiian Islands inspired this painting. Imaging approaching this harbor by sea in a modest sailboat. 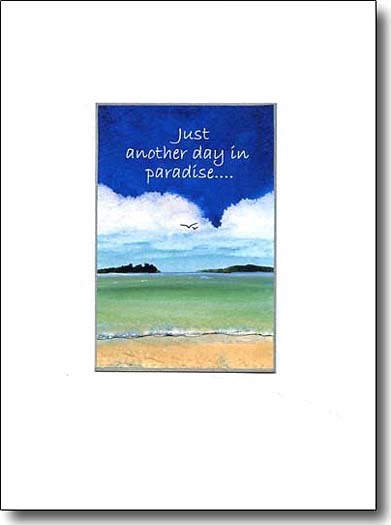 This romantic card is so right for a wedding, anniversary or Valentine's greeting card. 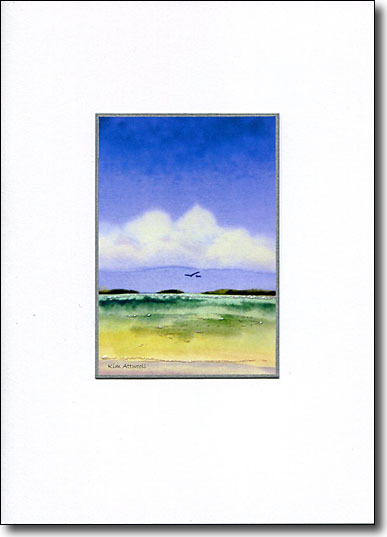 Walking towards the sea across the warm sand makes this card universally appealing. 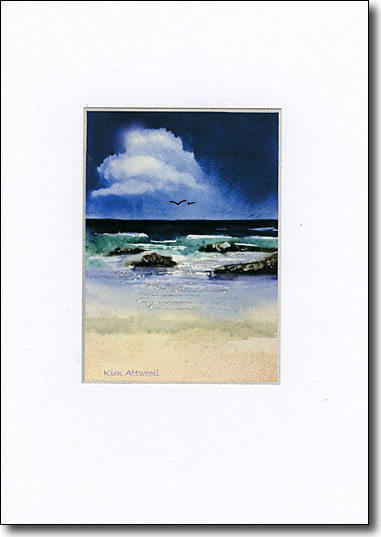 The sandy sparkles enhance it by coming out of the picture onto the card. 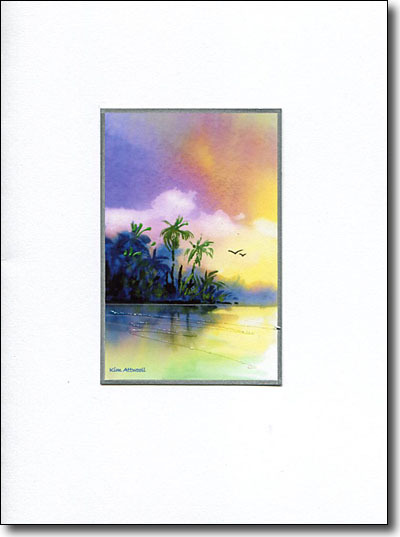 This card is very popular as it captures tropical warmth and beauty. 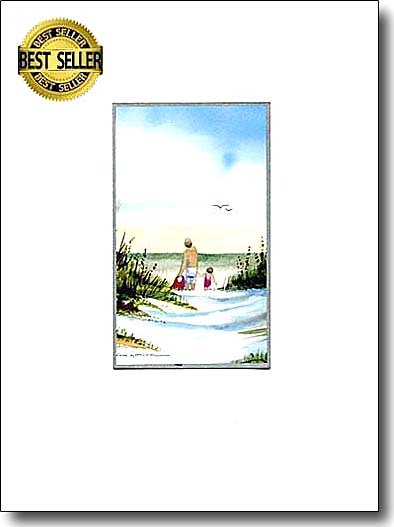 Framed, it makes a pleasing gift. 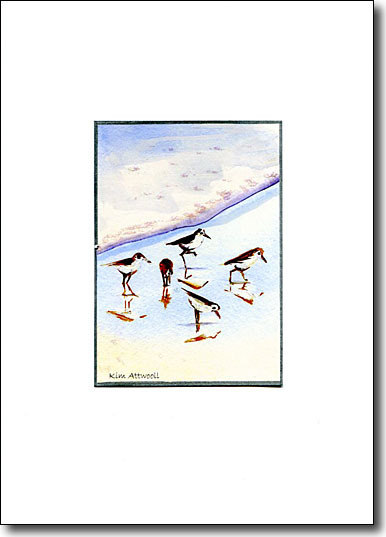 Send this to friends who agree that it is a joy to walk bare footed where the sea washes the sand. 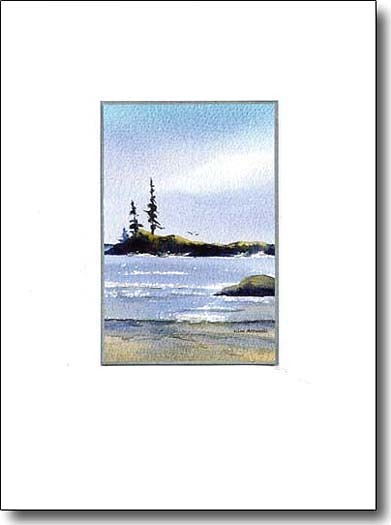 Beautiful Vancouver Island inspired this painting. 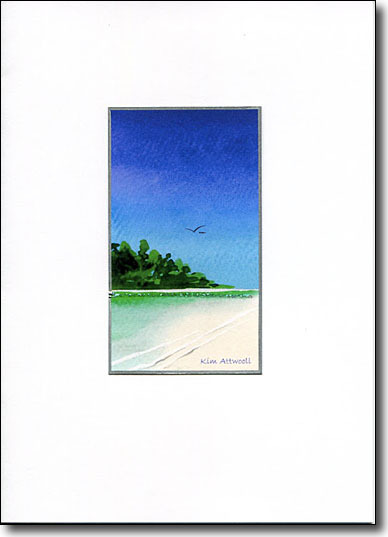 The greeting card is calming and could be used as a sympathy card. 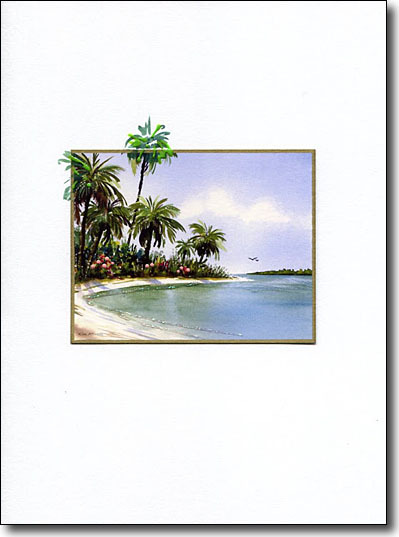 Sparkling waters edge and islands in the distance make this an appealing all occasion greeting card. 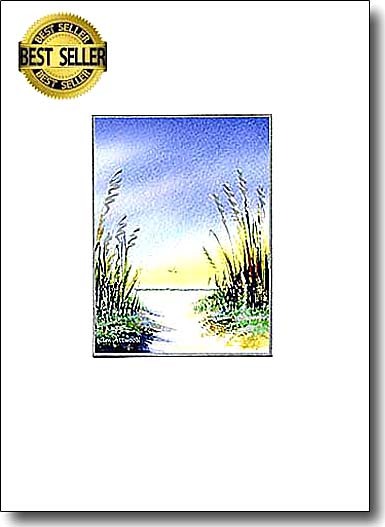 This calm seascape is embellished with silver beach grass. 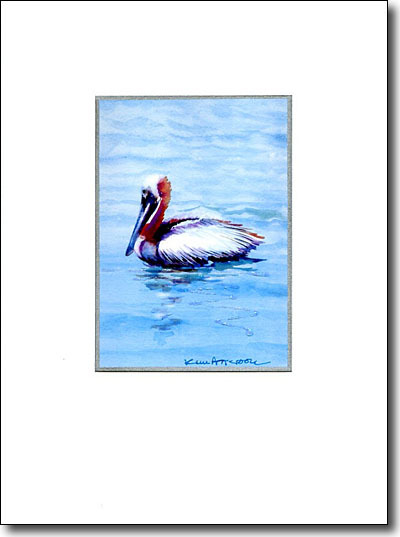 It's an image that calms and is lovely framed in a 5 x 7 silver frame. Send it as a caring sympathy or get well card. 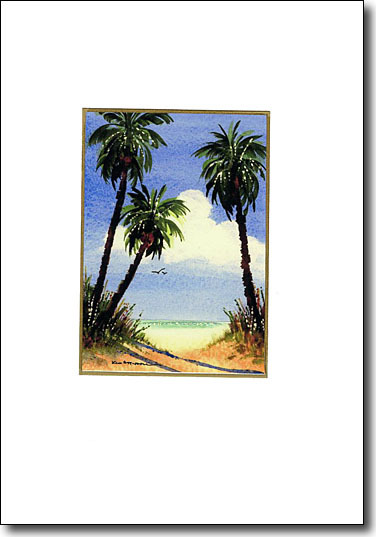 Here is one of my first beach cards. 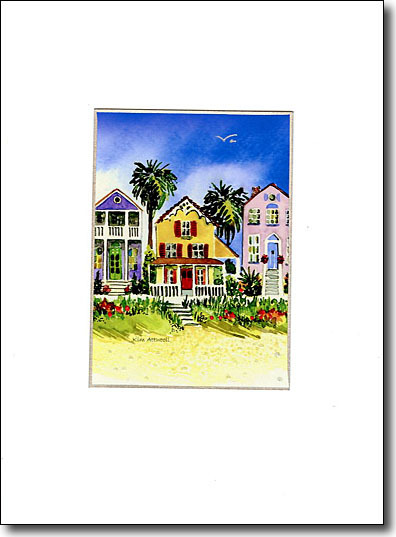 It is inspired by the beautiful warm waters of the Gulf. 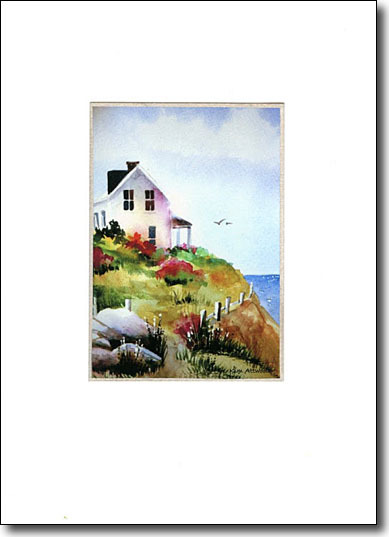 The picture expresses simplicity and warmth. 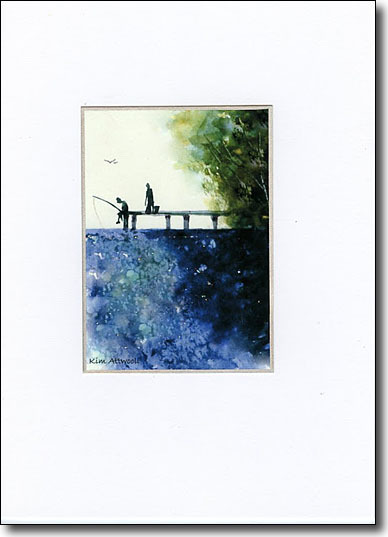 Give to a friend who needs to escape the travails of everyday life. 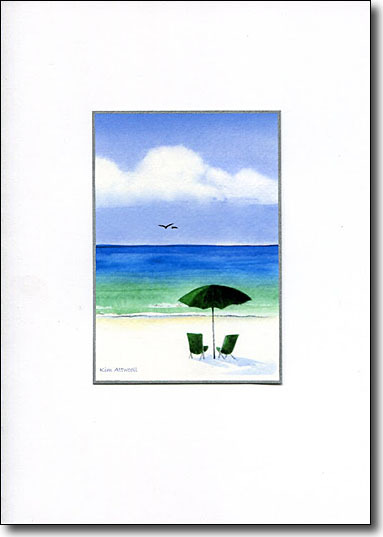 This simple image is iconic and perfect for beach lovers. 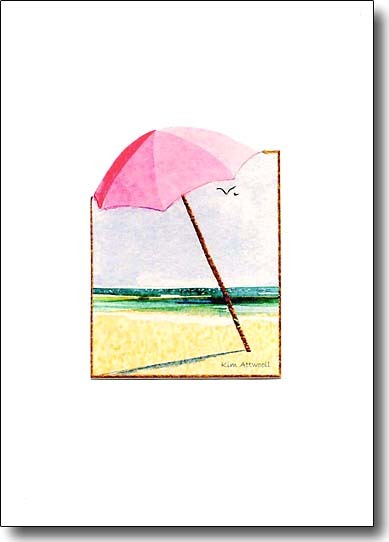 I embellish every one with sparkles on the water and the top of the umbrella is cut out. 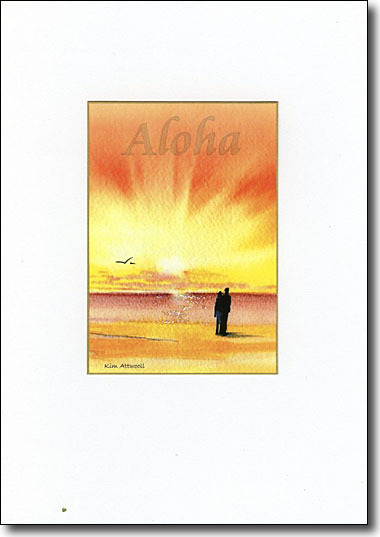 Send this card with a warm message of friendship. 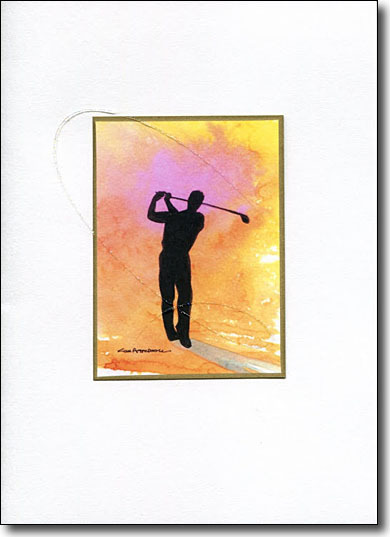 It glows with warm colors and a golfer silhouette. The sparkle embellishments suggest the path of the golf club. 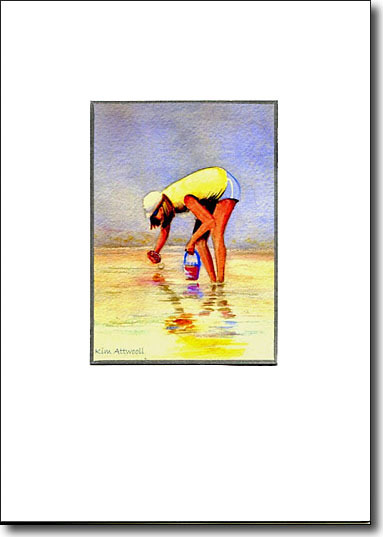 Duffers of any age will be delighted to receive the greeting card. 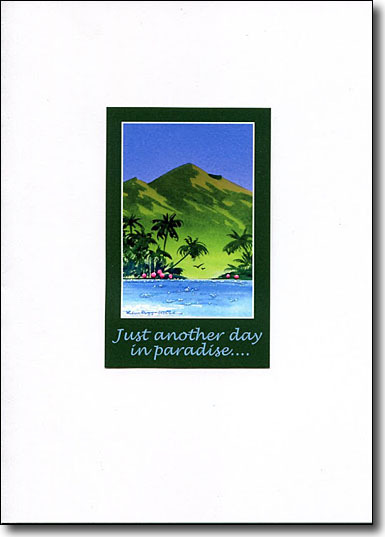 This graphic card is a simple scene that suggests getting away from it all. It's a great picture to frame. 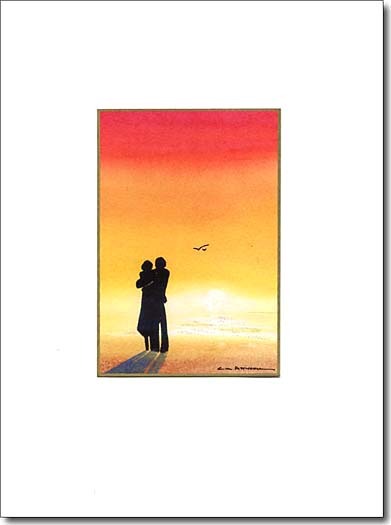 This romantic image is a fun painting. I put glowing colors on the paper and when it's dry, the silhouette is added. It's embellished with touches of gold. 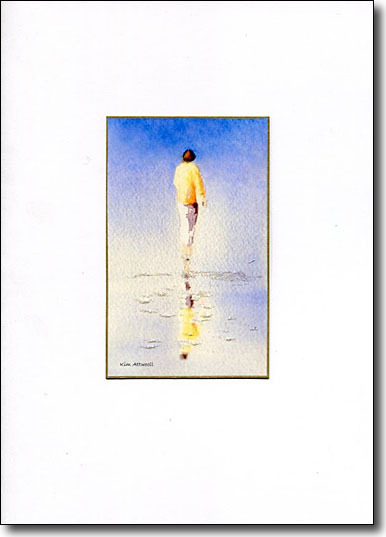 This is a love card, perfect for all occasions having to do with love. 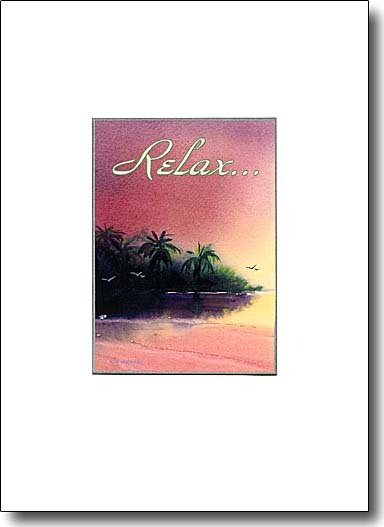 The brilliant pink sky of this watercolor painting holds the word "Relax". Share it with a friend who is in need of a break. Relax, escape be calm. This image is a tonic for the stressed and overworked. Use this card to remind friends to chill. Frame it in a 5 x 7 frame and mount it as a reminder that warmth and simplicity are life enhancers.